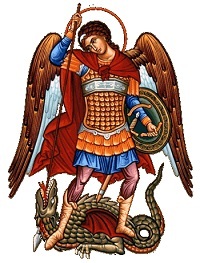 Prayer To Saint Michael The Archangel - St. Michael the Archangel, defend us in battle. Be our defense against the wickedness and snares of the Devil. May God rebuke him, we humbly pray, and do thou, O Prince of the heavenly hosts, by the power of God, thrust into hell Satan, and all the evil spirits, who prowl about the world seeking the ruin of souls. Amen. 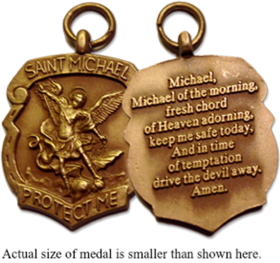 If you would like to receive a St. Michael medal free of charge from the organization AMERICA NEEDS FATIMA, please click HERE. The beautiful medal -- depicting St. Michael in battle -- is about one inch tall, made of brass with a bronze finish.